The Law Offices of Powers Law Firm, a Charlotte-Metro based law firm, is included in the 2018 U.S. News – Best Lawyers ® “Best Law Firms” publication. The firm is named a Charlotte Tier 1 “Best Law Firms” for the area of DUI / DWI Defense. 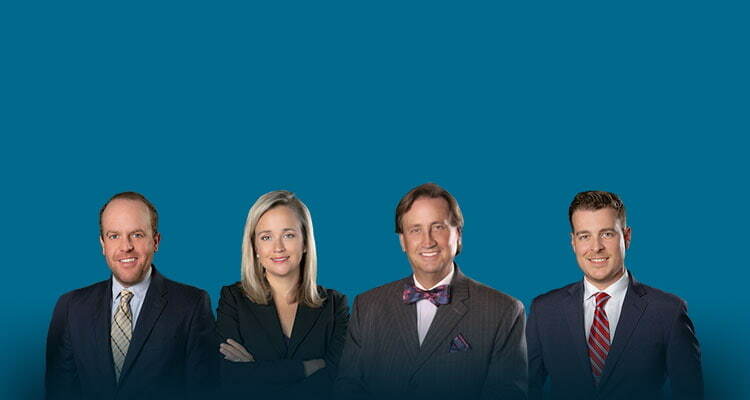 To be eligible for review, a law firm must have at least one attorney whom is listed in The Best Lawyers in America®. Attorney Bill Powers is named again in The Best Lawyers in America 2018. “Gracious, what an honor it is to again be included both individually in Best Lawyers in America and as a firm within Best Law Firms. I'll do my best to live up the tremendous honor,” says Bill Powers. “ Best Lawyers is the oldest and most respected peer-review publication in the legal profession. A listing in Best Lawyers is widely regarded by both clients and legal professionals as a significant honor, conferred on a lawyer by his or her peers. For more than three decades, Best Lawyers lists have earned the respect of the profession, the media, and the public, as the most reliable, unbiased source of legal referrals anywhere. 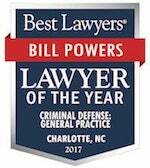 Bill Powers, Criminal Defense Lawyer Charlotte NC - A Perspective - After more than 25 years practicing law in North Carolina, how do you see yourself as an attorney? First and foremost, I’d say “lucky” or “blessed.” It truly is an honor to help people with legal issues. I used to say, “I accidentally fell into the practice of law.” Then I found something I had written in 7th grade, in 1977, predicting the future and what profession would best suit me. Lo and behold, “lawyer” was my chosen vocation at age 12. Go figure. To be entirely frank, I suspect my reasons for wanting to be a lawyer, back when Jimmy Carter was President, we filled up with “regular gas” at .62 cents per gallon, and Star Wars was something new, were less than altruistic. Indeed, I can’t say I even went to law school for all the right reasons. Unfortunately, I fear many law students and young attorneys may unwittingly fall into that trap. If you go to law school for any reason other than to help people, you have a surprise coming. And that “surprise” may indeed turn out to be unfulfillment, discontent, and tremendous regret, attached to a ¼ million-dollar debt in school loans. Privately, I also say a little prayer, “Dear Lord, please save that person from a lifetime of frustration and the court system from someone who believes being a lawyer is arguing for the sake of argument.” I may disagree with opposing counsel on a point of law; but, how we express differences of opinion in court are something entirely different. The truth is, taking a stand without a cause or a purpose, a legitimate cause or purpose at that, is largely a waste of breath. Our goal as lawyers must always be to reap a harvest of Justice for All. The longer I practice law, the more convinced I am that it remains an honorable profession, fulfilled by people who believe in the Rule of Law, compassion, and justice. Idealism, and the hope for a better future, are condition precedents to be an effective advocate. Perhaps my vision is a bit clouded on the issue, given my relationship and long-term love affair with the North Carolina Advocates for Justice and its highest, inspirational goals. That’s what I’ve learned in more than 25 years in the courtroom trenches of North Carolina. Why did you become a Criminal Defense Lawyer? Is there a skill-set or preferred personality type for lawyers who handle Criminal Charges in North Carolina? My answer might come as a surprise to some, especially if you don’t know me. Other than the first couple of years of my practice, when I worked for the State of North Carolina, I have never limited my practice to criminal defense in Charlotte NC. I believe one of my greatest strengths is the number of different types of cases I’ve handled, both civil and criminal, after felony indictment or misdemeanor charge, as a courtroom attorney. Yes, I am a board certified criminal law specialist (by the NBTA / NBLSC); but, I’ve also served as legal counsel in complex contract and shareholder derivative actions, I have helped people with employment discrimination matters in NC, both on behalf of the employer and the employee. I’ve written wills and powers of attorney, incorporated businesses, and litigated personal injury cases to the North Carolina Court of Appeals and Supreme Court. I’ve also handled hundreds of family law related issues involving custody, parental rights, child support, and have even served in the role of Guardian ad Litem. People know me as a criminal defense lawyer and that’s OK. I prefer to stay under the radar. I think it has made me a better lawyer to understand many different aspects of the law and how they apply to citizens in North Carolina. If there were one constant in my professional experiences, it would be the courtroom. That truly is not incongruent with my overall perspective of trying to avoid arguments and a general disdain for an overly-litigious style. It’s because of my years in court that I understand the importance of compromise and the application of civility and common sense. I have won cases in court and lost cases after a bench or jury trial. I can’t help but think that a reputation as “a litigator” must occasionally proceed me. With experience, both good and bad, comes discernment. It’s easy to talk smack about the value of a case and threaten litigation. It’s a thing altogether different to proceed to trial, fully understanding the nature of jury trials in North Carolina. Litigation has made me a better lawyer, if for nothing else than to be able to critically evaluate the merits of a case and predict what a jury might do. That’s where the rubber hits the road as both a criminal defense lawyer or civil litigation attorney in North Carolina: The Jury Trial. It is the great equalizer. What don’t you like about practicing law? Are there negative aspects of being a Criminal Defense Lawyer Charlotte NC or a DWI lawyer in North Carolina? Is it different for Personal Injury attorneys or other forms of tort law or civil litigation? Like many people, my greatest strengths as an individual are also, at times, my greatest weaknesses. I tend to be overly competitive. I hate to lose. If I am going to argue with someone, I truly believe I’m right. . .and not just a little bit right. I also occasionally internalize legal issues. I can take cases and causes personally. I don’t like winning for a wrong reason almost as much as I despise losing a case for another wrong reason. In criminal defense, if I win due to a technical or procedural call on something involving reasonable suspicion or probable cause in North Carolina, I can live with that. Close cases under our constitution are supposed to go to the accused. The constitution was never intended to be fair to the State. Holding the State accountable to the Rule of Law protects the rest of us, even though a client may be the immediate beneficiary. Losing a criminal defense case, unjustly or contrary to the law, bothers me tremendously. I lose sleep. I carry it with me. That’s because someone is hurt, due to the long-term consequences, with a wrongful criminal conviction, especially if it includes a prison sentence. Those general precepts are also true in civil law, even though the arguments are often over money. While it’s easy to discount the value of a fair judgment in civil court, you’d be amazed how quickly peoples’ lives can be ruined as a result of a bad car wreck or other negligent act. It’s not just about the money. Yes, money pays for things like treatment, physical therapy, and long-term care. But, I’ve yet to have a client who wouldn’t trade the money for the quality of life they had before the injury or collision or the loss of a loved one. I realize I haven’t answered the question. Yes, there are things I don’t like about the law and the practice of law. I see and am forced to occasionally live with some tremendous inequities in the system. I don’t like that. I hear people in court talk about the Presumption of Innocence and Reasonable Doubt, only to sometimes see jurors presume the exact opposite, to always believe the State’s side of the case or err in favor of the insurance companies, to their substantial financial benefit. I don’t like that either. As I’ve gotten older and practiced law longer, I wish people in the system would be a little nicer to one-another, and perhaps a little more patient. Court calendaring is unnecessarily burdensome at times in North Carolina. But as a whole, I like what I do more than I don’t like certain aspects of the practice and being a lawyer in North Carolina.